1. ORIGINAL Printing. Yessayan printed each value on a separate sheet (i.e., normally). As far as I know, no complete sheets now exist and the largest multiples are probably no larger than twenty or thirty stamps. Three values were not issued at all, and the other five values were only issued with surcharges. The values which were not surcharged are scarce and the issued values are rare without surcharge. There is some colour variation in this Original printing and for the grey stamps, there are two distinct papers - though it seems that only some values can be found with both papers. All the stamps were gummed and the gumming is the same as that found on First Yessayan stamps: done with a machine and with a clear gum stop at the sheet edges. 2. FIRST Reprint. Yessayan prepared these for the stamp trade. 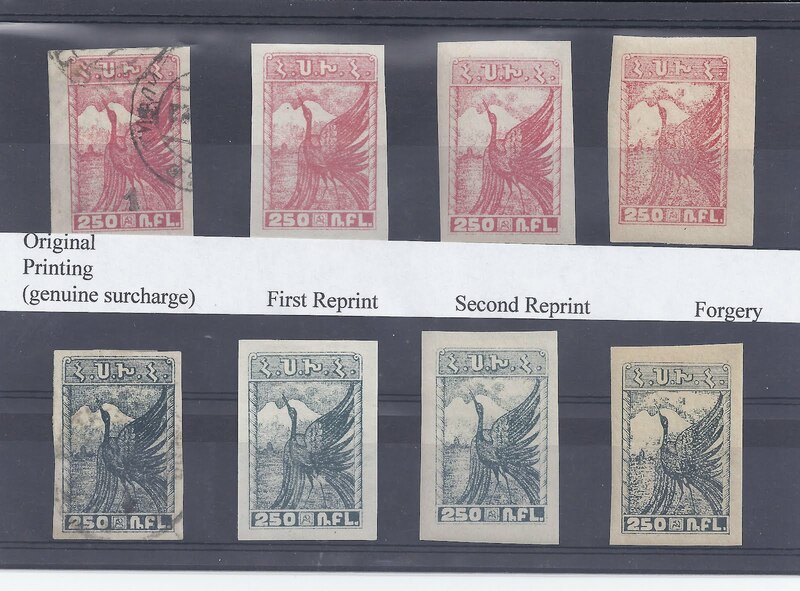 None were sent to Yerevan and none can exist with genuine surcharges: a surcharge on a Reprint is ALWAYS a forgery. To economise on lithographic plates, Yessayan RESET the eight values onto just two plates of unequal size. These two plates yield 147 stamps in total providing stamp dealers with 18 sets and 3 spare stamps .... Most sheets were cut up for the packet trade and se-tenant multiples are rarely seen. The paper is always white. About half the sheets were not gummed, and the other half are with white gum which has a different appearance to that used on the Originals. A pair of First Reprint sheets are in the April 2012 Corinphila auction (Lot 1764). They are from me. 3. SECOND Reprint.. Again to supply the stamp trade, Yessayan made a Second Reprint (probably a couple of years after the First)and this time used just one plate for all values. There are 74 stamps on this plate, yielding 9 sets and 2 spare stamps ... Most of the sheets were cut up for the packet trade and se-tenant multiples are rarely seen. 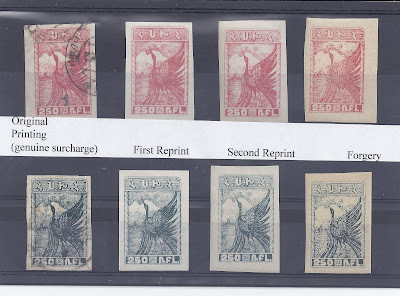 None were sent to Yerevan and a surcharge on a Second reprint stamp is ALWAYS a forgery. This second reset plate shows the stamps with worn impressions - there are more white areas. The colour of the stamps looks pale in comparison to the First reprint but actually the colours are very similar - it is just the extra white areas which make the stamps look pale.The paper is again white. It seems that most of the sheets were gummed. The gum is yellowish and gives the paper a yellowish appearance. 4. The Forgery. There appears to be only one Forgery type. The designs are crude, the paper grey, and the gum thick and yellow. The Forgeries copy the Reprints: the different values are printed se-tenant, but I do not know if one or two plates were used.Examples can be found with the gum washed off and from these copies you can see that the paper is normally grey and coarse. For some reason, red Forgeries appear to be scarcer than grey forgeries. The listing of surcharged stamps in the Michel catalogue is good, but the pricing of the unsurcharged stamps is not sensible.